As the weather cools down, the fishing in the rivers, residential canals, and power plants heat up. With the bay and inland water temps getting down into the 60′s, fish will start migrating to feed in and near warmer waters. The other day I was on a charter with a couple good guys from Englewood who contacted me through the Englewood Fishing Club. We were fishing the mouth of the Little Manatee River on a cool windy day for snook, reds, and trout on a low low tide. The tide went slack and the bite shut down. We made a move to the TECO power plant in Apollo Beach to look for cobia and triple tail during the slack low tide. We didn’t see any triple tail but we pulled up on a channel marker and found a dozen cobia daisy chaining around it. 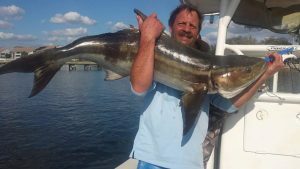 Most of the cobia were in the 40lb range and one of them looked to be over 60lbs. I was stuttering out instructions and my hands were shaking. I knew we were going to get our limit of huge cobia. Unfortunately they would not eat. We casted live, dead, and cut greenbacks, pinfish, and ladyfish at them and could not get them to bite. I searched my tackle bag for a plastic eel and couldn’t find one. These cobia hung around my boat and the marker for 10 or 15 minutes; it was a helpless feeling. Most of the time cobia are ferocious eaters, eating almost anything you put in front of their face, especially when there’s many of them together, they normally compete for your bait. We were excited to experience such a cool sight, but at the same time, we felt the agony of defeat. We transferred back to the river to fish snook, reds, and trout on the afternoon incoming tide. We caught several of each fish. Our biggest trout was 26in our biggest red was 24in, and snook was 24in. Good quantity and decent quality and this should continue throughout the winter months. Tips for December: *Chum a lot: When the water gets cool, fish get lazy and their bodies slow down and they almost go into hibernation. Oft en when we clean a fish during this time of year their bellies are empty. When you chum a lot this time of year, you can put the game fish into a frenzy, taking advantage of the easy meal while they’ve got it. For snook, reds, trout, mackerel, kings, jacks and tarpon, chum with crippled greenbacks. For mangrove snapper, sheepshead, whiting, silver trout, grunts and pompano, chum with cut chunks of shrimp, or crushed up fiddler crabs, or scraped barnacles. *Use a lighter leader and smaller hook: During the winter the water clears up a lot and the fish might spook from a thicker leader or big hook. I’m not big on fluorocarbon over non fluorocarbon mono. I know the line companies have done all kinds of testing and research and development on mono clarity, but I’ve fished fluorocarbon and non fluorocarbon mono for years and catch the same amount of fish on either. Try to use a hook small enough to be concealed in the bait. *Free line on the flow: When the tides moving, free line live bait for your predatory fish, like snook, reds, trout, etc. When the tide goes slack fish with split shots, sinkers, on cut bait or artificial baits. I love to see a hooked bait fish flow past a dock or a mangrove bush and get crushed. Not saying I don’t like to see a Bomber plug, DOA Cal, or Gulp Shrimp get whacked, but it’s hard to beat Mother Nature and when the tide is fl owing back in the rivers and residential canals, especially when bait is scarce during the winter months, game fish will hit bait fish hard and oft en. 10 to 1 over artificial in my opinion. *Find the bait: During the winter months bait fish can be hard to find. Sometimes I have to spend twice the time I usually do finding bait fish. You can be the best angler in the world with the best secret spots, but if you don’t have the right bait forget about it. You have to know what they’re feeding on and how to catch what they’re feeding on.